This is a continuation of our weekend indulgence which started with enjoying our egg custard “chawanmushi”. Since I ordered a fairly large amount of yellow tail or hamachi sashimi from Catalina I discovered that there is such a thing as too much good sashimi. 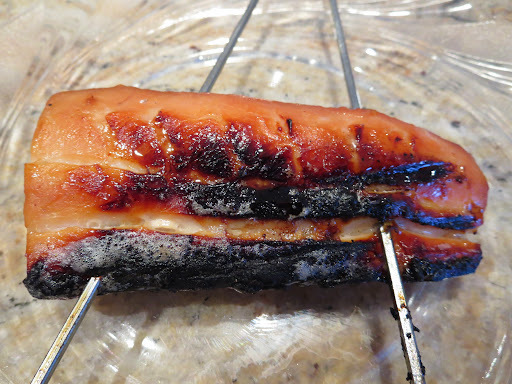 I decided to make miso-marinated and grilled Hamachi from one of the fillets. As a accompaniment, I also made simmered daikon, baby red potato and carrot. After marinading the piece of fish for 10 hours in the refrigerator, I grilled it over a charcoal fire. The surface was nicely charred but the meat was just cooked (I could have under cooked it a bit since this was originally for sashimi). Initially, I planned to broil this inside in the toaster oven. At my wife’s objection (saying even if the kitchen remained odor free, the toaster oven would smell like fish afterwards), however, we decided to cook it outside using a Weber grill and a charcoal fire. By the time I was ready to grill, it had started snowing (this was the start of a large late season nasty snow storm which resulted in significant accumulations by the next day). In any case, rather than placing the fish directly on the grill (risking its sticking and losing the crispy skin) I used two long metal skewers so that the fish filet was suspended over the fire and grill without touching anything. I cooked it less than 3-4 minutes on each side (about 7-8 inch above the hot charcoal fire). Miso marinade: Since I was out of sweet “Saikyo” miso 西京味噌, I used regular miso (3 tbs), sugar (2 tbs) and mirin (just to loosen the mixture to the right consistency). I also added splashes of Yuzu juice (from the bottle). 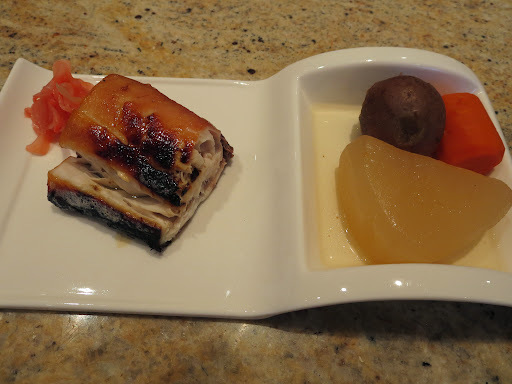 I wrapped the hamachi filet in one layer of moistened cheese cloth and placed it in a Ziploc bag and spooned in the miso marinade. I massaged it to make sure all the sides of the fish fillet were covered with the miso. I pressed out any air and sealed the bag. I placed it in the refrigerator for 10 hours before cooking. 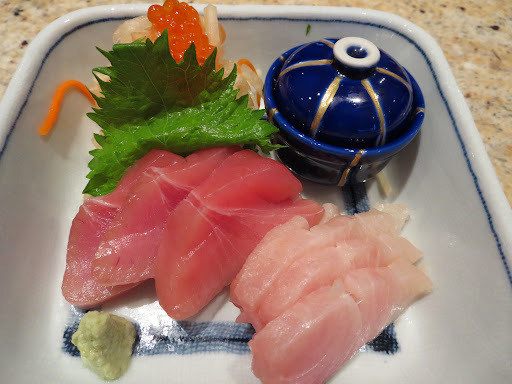 Of course, we also had tuna and hamachi sashimi. 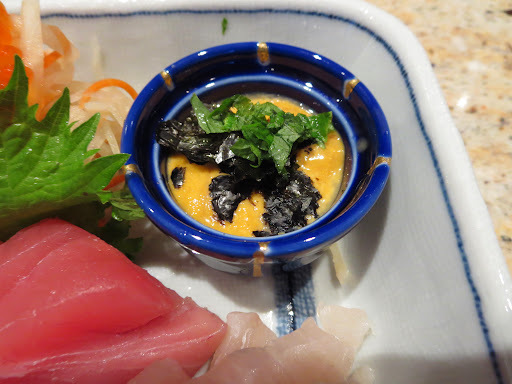 Since the “Premium” uni was a bit soft, I placed it in a tiny bowl garnished with nori and chopped perilla aojiso 青じそ and splashed on some Yuzu juice (from the bottle). Everything was quite good. The simmered daikon was very soft and flavorful (I cooked it first in water with several raw rice grains for 30 minutes and then simmered it in kelp dashi seasoned with salt, light colored soy sauce and mirin for another 30 minutes). 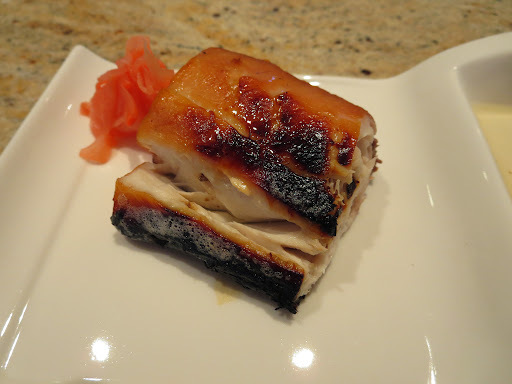 The grilled miso-marinated hamachi was moist with a lovely oiliness. The miso marinade added a nutty sweetness. We started with our house sake “Mu” 無 and switched to “Dassai 50” 獺祭５０. Both sakes were good but we still like “Mu” best.